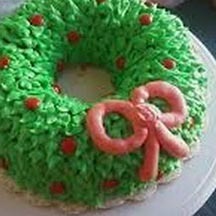 A fun, festive Bundt® cake decorated to look like a holiday wreath. Bake in 10-inch Bundt® pan. Tint vanilla frosting with green food coloring. Frost cooled cake; sprinkle with colored sugar sprinkles. Garnish with cinnamon gum drops, or as desired.